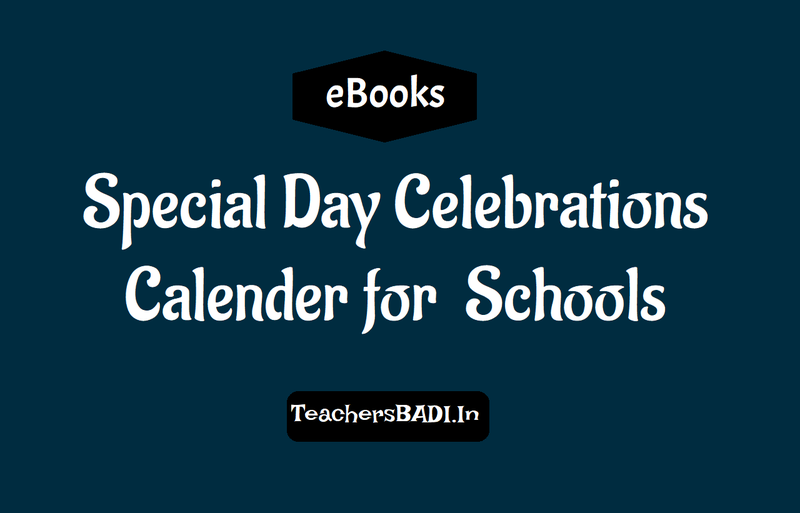 Uses of Celebration of Special Days in the Schools: As per Proceedings Rc.No.1005, Dated: 13-08-2018, the State Project Director, Sarva Shiksha Abhiyan(SSA), Telangana State has issued Special Days Calender to all the Project Officers in the State, District Educational Officers in the State, Mandal Educational Officers in the State/All the Dty.E.Os in the State and Sectoral Officers in the Head Office for Celebration of Special Days in the School for creating awareness to the students. In this subject it is the common practice in the schools to celebrate the National Days like Republic Day, Independence Day etc. These celebrations are aimed to create awareness and inculcate national spirit into the tender minds of the students. On the same lines, there are some other National/International Days of importance celebrating all over the world. There is a need to celebrate these special days also in the schools to acquaint the students with various aspects, by which it is possible to mould the student to attain the goal of comprehensive personality. The following list comprises the Special Days to be celebrated in the Schools for the purpose mentioned above. Further, it is directed that, these Special Days should be celebrated with the involvement of School Manage Committees concerned and without effecting the Regular academic programme. Importance: Explaining the importance of tourism nationally & internationally will broaden the minds of the young students and will grow the respect towards other cultures and traditions, which ultimately brings peace and harmony in the civic life. Who has to take lead: By the involvement of Science Teacher, the Programme may be organized and a lesson may be taught to the students with the help of You-tube as an application of Telecommunication in school process. Importance: The ancient sage Bharthruhari said “The person without education is a strange animal”. Who has to take lead: This job can be best performed by the Languages Teacher. Objective: Toilets if not maintained properly shall cause infections and diseases. Therefore stress to be laid upon sanitation, hygiene, cleanliness of surroundings and washing the hands before and after meals etc to be explained. Importance: The Former Prime Minister of India, Sri. Lal Bahadur Shastri proclaimed “Jai Jawan – Jai Kisan” the concept may be enlightened to the children. Another Prime Minister Sri. Chaudhury charan singh’s birthday is being commemorated on this day. Who has to take lead: The PET may take lead to enlighten the students upon the various activities involved in agriculture, by taking them to a nearby agricultural field. Field Trips to the nearby places related to the Special Days. The HM/Teachers are instructed to organize single or multiple activities mentioned above, as per their initiative, interest and convenience. The HM/Teachers are at liberty to design and execute any other Innovative programme also to commemorate the Special Day, apart from the activities enlisted above. These Special Days should be announced by the HM/Teachers in the School prayer itself, along with the details of the programme designed for the purpose. The MEO/DEO/PO/Dty.E.O should take necessary steps and issue directions for implementation of these instructions in the schools of their respective jurisdictions, besides monitoring the same.